Display with 21 individually wrapped mini cakes made of biscuit with milk cream filling and Alpine milk chocolate coating. 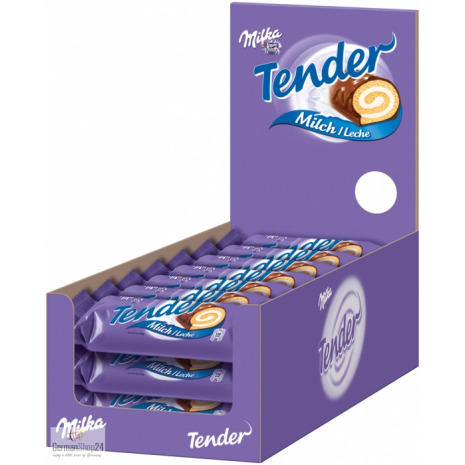 Milka Tender Milk combines a layer of light and airy vanilla sponge cake with a delicious milk cream filling and a smooth melting chocolate crust made of Milka's signature Alpine milk chocolate. Irresistibly good. Each counter display contains 21 individually wrapped cake rolls. Irresistibly delicious. 777g / 1.71 lbs NET. WT. Sugar, WHEAT FLOUR, EGG, glucose-fructose syrup, vegetable fats (palm, palm kernel, coconut), 8.5% sweetened CONDENSED MILK (WHOLE MILK, sugar), humectant (sorbitol), cocoa butter, SKIMMED MILK POWDER, cocoa mass, SWEET WHEY POWDER (from MILK), BUTTERFAT, emulsifiers (SOY LECITHINS, mono- and diglycerides of fatty acids, polyglycerol esters of fatty acids, polyglycerol polyricinoleate), alcohol*, salt, raising agents (diphosphates, sodium carbonates), flavors, WHEAT STARCH. *For improving the durability. 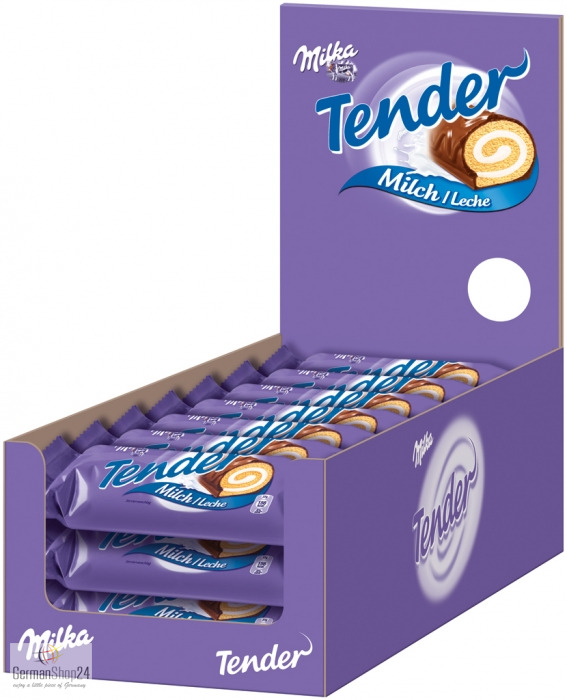 Zucker, WEIZENMEHL, EI, Glukose-Fruktose-Sirup, pflanzliche Fette (Palm, Palmkern, Kokos), 8.5% gezuckerte KONDENSMILCH (VOLLMILCH, Zucker), Feuchthaltemittel (Sorbit), Kakaobutter, MAGERMILCHPULVER, Kakaomasse, SÜSSMOLKENPULVER (aus MILCH), BUTTERREINFETT, Emulgatoren (SOJALECITHIN, E471, E475, E476), Alkohol*, Speisesalz, Backtriebmittel (E450, E500), Aromen, WEIZENSTÄRKE. *Zur Verbesserung der Haltbarkeit.